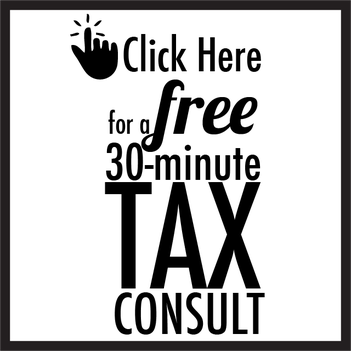 We're taking a break this week from our normal business tax preparation series to focus on individual tax returns. This is the first year the Affordable Care Act (commonly referred to as Obamacare) will come into play, impacting your return. It's important to understand the rules, regulations, and penalties of Obamacare before having your 2014 tax returns prepared. Your tax return won't change that much. During your tax preparation, you'll have to check one box on the forms that tells the IRS you had coverage in 2014. That's pretty much the jist of the changes for you. The IRS is charging penalties this year if you weren't covered by health insurance in 2014. These penalties are based off two formulas that determine your fine. Flat Dollar Amount Penalty: $95 per individual, $47 per child. Household Income Penalty: 1% of your total household income. According to the IRS, you'll be fined whichever of the two penalties is greater. The household income is determined by taking your adjusted gross income, which is the total amount you made in a year, and subtracting a threshold amount. If you make below a certain income threshold in a year, the IRS doesn't require you to file a tax return. These thresholds are $20,300 if you're married, and $10,500 if you're single. Household Income = $50,000 - $10,150 = $39,850. As stated before, the IRS will fine you based on whichever of the two penalties is greater. 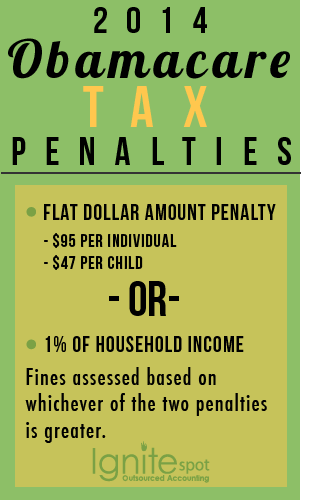 To determine what your penalty would be, take your household income of $39,850 and multiply is by 1%. Since the flat dollar amount penalty is $95, and the penalty based on your household income is $39.85, the IRS opts for the greater of the two. So you're looking at paying the flat dollar penalty of $95 on your 2014 tax return. 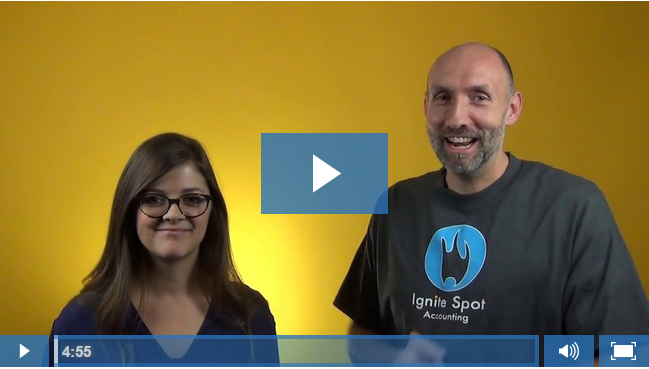 Ryan: Hi, I’m Ryan and I’m the lead CPA here at Ignite Spot. Meghan: And I’m Meghan and I’m in the marketing department. Ryan: We’re excited to be here today and excited to talk to you about Obamacare and what it means for your individual tax returns. Ryan: Ok, first, lets cover the easy part. Most Americans had health insurance this last year. If you have health insurance, your tax return hasn’t changed that much.You have to check one box that says you had health insurance for the year. And you’re pretty much done with your taxes as far as Obamacare and health coverage reporting goes. Meghan: So you don’t have to provide any form of proof besides checking a box? Ryan: You do not have to provide any proof besides checking a box this year. Ryan: And in fact, quick side note, the IRS has had their budget slashed this last year, so they have less money than they had last year. Plus they’ve been given full responsibility of covering Obamacare as well as doing their regular IRS duties. So they’re in a bit of a pickle this year and trying to figure out how they’re going to manage and control all this. Ryan: Ok, so as we’ve talked about, if you had health coverage throughout the year, there’s really not much that has changed. If you’ve had partial coverage or too much coverage there’s a lot of complicated rules going into that process right now; we’re not going to cover those today. Most people either have coverage or they don’t have coverage. And that’s what we really want to talk about today. So, if you didn’t have coverage throughout the year, we’ve heard about the Obamacare penalties. Ryan: So there are some forms and some things you need to know if you have not had health insurance coverage for the 2014 tax year. Ryan: What the IRS has said is they’re going to charge a penalty if you haven’t had coverage and that coverage is based on a formula. There are two formulas they look at. The first thing that the IRS has said is that they’re going to look at what’s called the flat-dollar amount penalty. Ryan: What the flat-dollar amount penalty says is that, under Obamacare, there are three plans: your gold, your silver and your bronze. They’ve averaged out the bronze plan nationwide and said that, on average, it costs $204 a month. And so what they’ve said is, based on this flat-dollar average, they’re going to come in and they’re going to assess what they’ve calculated is a penalty of $95 per individual and $47 per child for not having health coverage. Ryan: The formula’s a little different than, but for the most part for most individuals who haven’t had coverage will fall under the $95 or $47 bucket. The other calculation they take is your household income. So what they’ve said the penalty is the greater of the flat-dollar amount or 1% of your household income. Ryan: So what’s the household income? The household income basically says: how much did you make in a year? On a tax return it’s called your adjusted gross income or AGI and from that amount they subtract what’s called a threshold amount. Ryan: The threshold amount is basically the IRS has thresholds where if you make under a certain amount of income during the year, you don’t have to file a tax return. Ryan: So for those threshold amounts, the IRS takes your adjusted gross income and actually reduces your household income by those threshold amounts. Ryan: So for 2014 for married people it’s $20,300 and for single individuals it’s $10,150. So what does that mean? If you earn lets say $50,000 in a year and you’re a single individual, you take $50,000 and subtract $10,150 and that becomes your household income. Now multiply that number by 1% and that’s the penalty. So it’s either that 1% or the flat-dollar amount. Ryan: That’s what you need to know when it comes to Obamacare if you’ve had health care or if you haven’t had health care. Meghan: What if you’ve only been covered for part of the year, does that still count as full coverage? Ryan: No, there’s some exemptions out there where potentially you can get away with, under some 3-month minimum rules, where it’s possible you won’t have to pay the penalty for those months. But the IRS does calculate the penalty on a month-by-month basis.